Each year, my wife Cheryl and I have all the first-year medical students over to our house for dinner in a series of small groups. When Dawn was over, she told me the story of her journey to medical school, and I instantly knew that I wanted to share it here. Dawn’s path is clearly not the one that we typically associate with medical students. But she doesn’t want us to think of her as an exception; she wants us to look at her story and realize that anyone from any background at any stage of life can pursue a medical education. While Dawn was growing up in a rural area of Nova Scotia, her family did not make her feel as if education was something especially important. Her father was a golf pro and her mother was an artist; neither of them had gone to university and neither of them ever made Dawn think that she should make a point to earn a degree. After high school, then, she did not bother applying to any universities, and instead moved out to Edmonton. She did not know anyone out there, but she thought of Alberta as a place that had a lot of opportunities compared to her hometown. At first, Dawn worked as a bartender at a golf course, but her career took a sharp turn after getting to know a regular customer. This man worked as a welder and, while talking about his job one day at the course’s restaurant, he bet Dawn that she couldn’t hack it in welding. Always up for a challenge, she took his bet and accepted a job at Strike Energy in Edson, Alberta. Dawn did not take up welding, though, just to try to win a bet. She considers herself a very hands-on person who likes work that blends problem-solving with manual labour. In many ways, then, welding seemed like it might make for a perfect profession for her. She started this job when she was 18 and enjoyed working with her hands and traveling around Alberta and British Columbia on various assignments. The man who had bet her that she wouldn’t be able to handle the profession was impressed by her and became a mentor to her. But he was also the person who eventually encouraged Dawn to leave welding. He had been warning Dawn for some time that the work is very hard on one’s body over the long run, and that it makes aging much more painful than it has to be. When she became a single mother at twenty one, Dawn ultimately left welding after having her first child and switched her career track by earning a certificate from a community college. From there, she went on to work as an educational assistant, in which role she helped learners with special needs. Outside of work, Dawn’s life also continued to change, as she got married and started to move around the country with her husband, who is in the Air Force. Her husband’s assignments took them to Manitoba and British Columbia before Dawn needed to go back to Nova Scotia to care for her mother after she had suffered a severe stroke. When Dawn thinks back to this period in her life, she sees the seeds of her interest in medicine being planted. Caring for her mother made her realize how fulfilling that kind of work can be, but she also had two other meaningful experiences at that time that made her consider pursuing medicine. First, Dawn had agreed to become a surrogate mother for a couple wanting to have a child. One of the men in the couple was a family physician, and she found it extremely reassuring to be able to talk to him throughout the experience. This experience taught Dawn just how meaningful doctors can be in people’s lives. She learned that healthcare providers do so much more than make diagnoses and prescriptions: they give peace of mind to the people in their care. Dawn wanted to be able to be a source of support for others in the way that this family physician was for her. Secondly, she had started an undergraduate degree program at Acadia University – which is close to her mother’s home in Nova Scotia – and found herself particularly invested in her biology coursework. For the first time, this made her think that she had a strong interest in science. While pursuing her three-year degree, she had two children, one being the surrogate baby. By the time she graduated, then, she and her husband had three children. 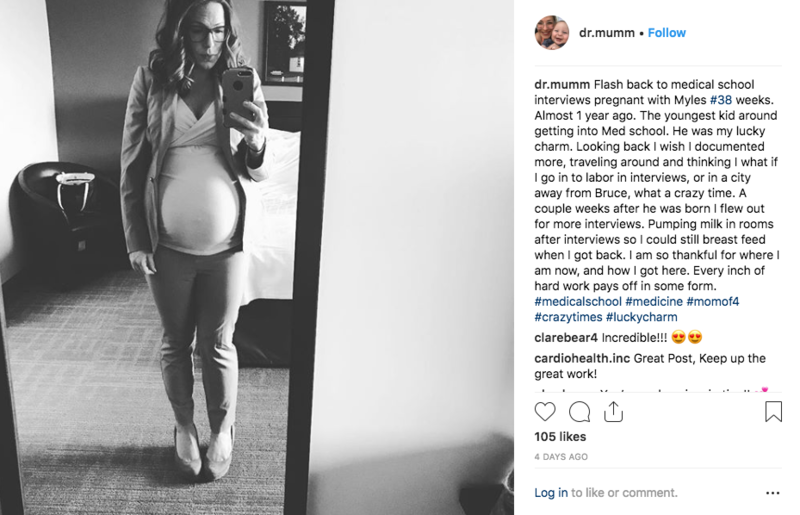 All of these different experiences – caring for her mother, raising children, surrogacy, and her coursework – made her decide to apply for medical school. 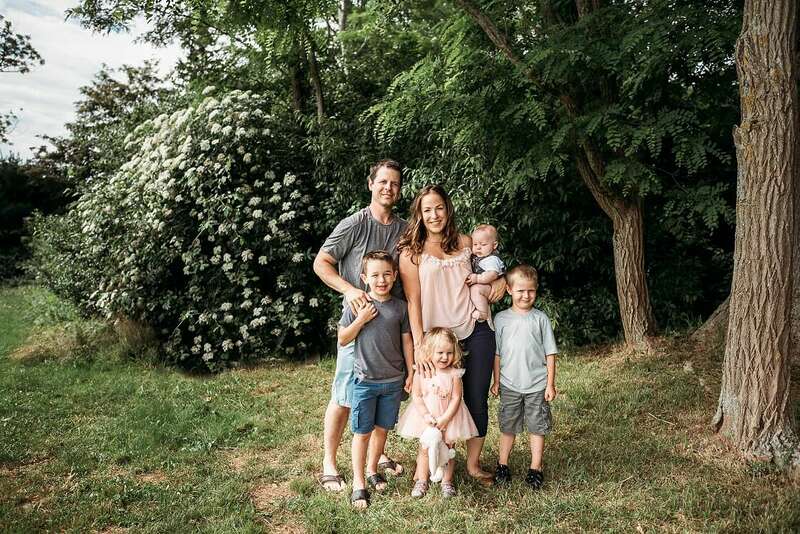 By the time she reached the interview stage of the admissions process, Dawn was close to the due date for her fourth child (not counting the surrogate pregnancy). When Queen’s offered her the opportunity to interview, she had to ask if they could accommodate her schedule, since the original date they proposed was very close to her due date. Asking for this kind of accommodation, though, was scary. What if it hurt her chances at being accepted? What if they just said no and she couldn’t even interview at all? Even if they agreed to help her, would they be annoyed? Dawn had no idea how the school would treat her as an expecting mother. To her pleasant surprise, though, Queen’s was more than accommodating. We enabled her to schedule her interview for after she gave birth, and assured her that we would make every possible arrangement to guarantee her comfort. Two weeks after having her fourth child, then, Dawn traveled to Kingston from Nova Scotia to interview at Queen’s. While she says that being away from her newborn and three young kids was hard, Queen’s made her feel at ease. When we offered her a seat in the class of 2022 a few weeks later, she had no trouble choosing to accept. Dawn is well on her way to meeting many of her goals. She has now completed her first semester of medical school, and she is currently completing a few research projects. She aims to be a dermatologist and knows Queen’s will prepare her well for this specialty. Dawn also feels at home at Queen’s. She says that neither her fellow students nor the faculty have done anything to make her feel separate or unwelcome. At gatherings, her children are welcome and made to feel included. 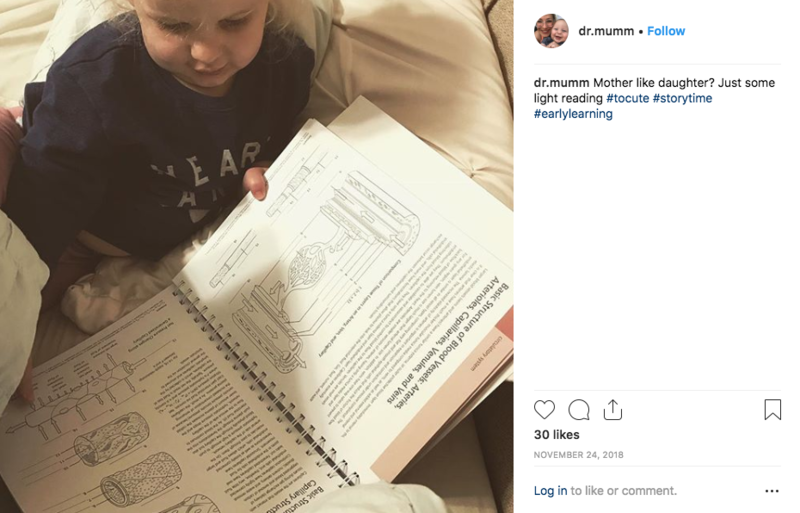 Knowing firsthand how much work it is to raise children, I am extremely impressed by Dawn’s ability to be a mother and a medical student at the same time. When I asked her how she finds the energy for school, she told me that she has the energy because she loves it. In some ways, she sees her classes as a nice reprieve from parenting. “School is my break,” she told me with a smile. Dawn also feels like her life experiences have prepared her well for medical school. She knows how to do the most with the time that she has. She knows not to cause herself undue stress over relatively small assignments, as she can see the bigger picture, like being grateful for having a healthy family. What I love about Dawn’s story is the way that it overturns so many stereotypes about who can and cannot go to medical school. We usually don’t think of people who didn’t go straight to university after high school as going on to medical school. Or people who were young mothers, or people who start their careers in manual labour, or people in their 30s, or people who have four children. But all of these things apply to Dawn, and she is thriving at the Queen’s School of Medicine. If you’re reading this and you’ve dreamed of pursuing a career in health care but feel like you’re too old or have too many children or have the wrong kind of background, please reconsider. Please put aside any preconceptions you might have about what kinds of people go to medical school and what kinds of people don’t. As Dawn’s story shows, all are welcome at the Queen’s School of Medicine. 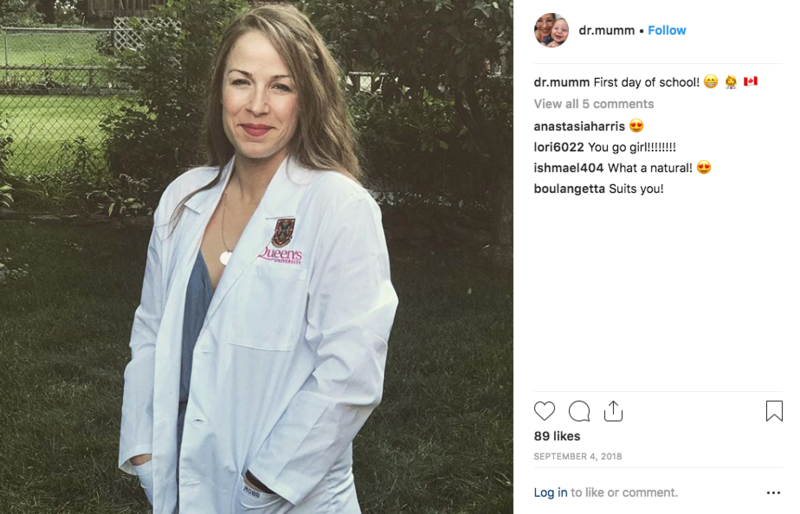 If you want to keep up with Dawn’s adventures as a mother and medical student, you can follow her on Instagram at @dr.mumm. As you can see, I've borrowed some pictures from her page, and there's many more great posts to look through there. Wow!! Impressive young lady! If she can do this, there's no stopping her! I'm happy for her that she has a supportive partner to share the parenting duties and encourage her emotionally when she no doubt, gets tired. Kudos to you, Dawn! Wishing you every success beyond what you've already achieved. Dawn's story is truly impressive! I couldn't agree more. What an inspiring classmate! We are lucky to have her. I agree, Elina. Glad to see you're inspired by Dawn's story as much as I am! What a wonderful story of someone who I am sure will be equally wonderful as a physician. Thank you so much for your comment, Dr. Braden. I have no doubts either that Dawn will make a wonderful physician. Thanks for pointing that out, David. That's really interesting. It's important for us to share those stories so people know that there are many different paths one can take to medicine. In my work as a career counsellor for aspiring medical students (at Queen's for 20 years and since 2007 in private practice), I often tell the story of "the other welder" Dr Walker mentions. I worked with him when he was applying for residency and was inspired by him, as I am by Dawn. Congratulations on finding all the talented students you do in a complex selection process! That's so great to hear, Christine! At Queen's, we're truly lucky to be able to work with such inspiring students. and I am sure that she is exceptionally brilliant and hard working. She is also clearly extremely sensitive and will surely be an excellent physician! I have no doubt either that she will be an excellent physician. And I hope that her story inspires others to see the "impossible" as something that could be in reach. Hooray for mothers in medicine! Congratulations, Dawn! I started med school with two kids, and added a third to our family at the end of first year. My class of 2013 classmates and our faculty were so supportive, and I hope the same will be true for you. Both parenting and medicine are team sports. Good luck to you and your family! Thank you for sharing your experiences, Sabra. It's great to hear from others who have been successful at being medical students and mothers at the same time.